PAUL JAY, SENIOR EDITOR, TRNN: Welcome back to The Real News Network. We’re talking with Gerry Epstein, from Amherst, Massachusetts. He’s the cofounder of the PERI institute, and he joins us from PERI. Thanks, Gerry. GERALD EPSTEIN, PERI COFOUNDER, PROFESSOR OF ECONOMICS: Glad to have the opportunity. JAY: So let’s talk about the Fed in terms of finance reform. There’s a lot of people that think the Fed is one of the pillars of the problem and we need to end the Fed, or some people say reform the Fed. What’s your view? EPSTEIN: I think the Fed is an important pillar of the problem. The main problem is that the Fed is not transparent and it’s not democratically controlled, and therefore the way it’s been working for almost 100 years is it’s been largely controlled by the banks. And what that means is that it’s another way in which the banks hold the economy hostage—by having enormous influence on what the Federal Reserve does. It’s able to control the kinds of policies the Federal Reserve takes with respect to regulatory policy, with respect to monetary policy—so making sure that inflation is low enough to maximize bank profits, that interest rates are at the right level to maximize bank profits, rather than having the Federal Reserve conduct monetary and regulatory policy that’s in the interests of society as a whole. Now, one would have thought, given how the Fed messed up in this crisis by allowing the bubble to go on as long as it did, by not enforcing regulations on predatory lending in the housing market, by other regulatory policies, looking the other way in consumer financial issues, one would have thought that the Fed would have been reined in and that some people at the Fed, Ben Bernanke in particular, would have been made to pay for the mistakes, but that hasn’t happened. In fact, Ben Bernanke was reappointed. The Fed under the Senate bill is going to be given a lot more power to regulate the largest banks. So rather than curbing the power of the Fed, in fact the power of the Fed has been enhanced. Now, there’s something in the House bill that subjects the Fed to a government audit. Believe it or not, until now the Fed hasn’t been subject to normal government audits of its activities, of all of its activities, particularly monetary policy. Moreover, the federal reserve does not have to go through normal budgetary rigours like any other agency of the government. It doesn’t have to come to Congress for its budget. Why? Because the Fed prints money. So the key is not to abolish the Fed, in my view. The key is to make it democratically accountable. Now, it’s not enough just to make it accountable to the president or make it accountable to the Congress, though that would be a step in the right direction; we also have to make it accountable to the citizens. And I think the best way to do that is to restructure the regional Federal Reserve banks so we have real citizen boards sitting on those banks controlling those regional Federal Reserve banks, of which there are 14. JAY: Well, then don’t you have to essentially change the nature of the Fed drastically? You have to stop it from being, you know, mostly owned by private banks. EPSTEIN: That’s right. You have to get rid of any semblance of bank ownership, you have to reduce or eliminate the power of the banks to name the directors of the Fed and to elect the president, and you have to create genuine citizens councils at the regional level to help guide the regional banks. JAY: So that’s a revolution. EPSTEIN: That’s a revolution in the Federal Reserve structure, to be sure. Now, the Senate takes a few baby steps in that direction, but it’s not nearly enough. Number one, rather than having the president of the New York Federal Reserve, which is the closest one to the banks, rather than have that president appointed by the bank board, which is loaded with big commercial bankers—. JAY: This is the job [Timothy] Geithner used to have. EPSTEIN: Yeah, that’s the job Geithner used to have, and that’s where they bailed out AIG. Instead of doing it that way, the Senate bill would have the president elect the president of the New York Fed. 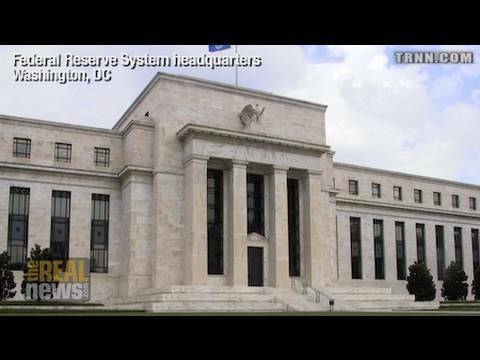 JAY: But he already elects the president of the Central Fed, and a lot of good that does. EPSTEIN: Right. So that’s not enough. Again, what we need to do is, first of all, give the Congress more backbone to regulate the Fed. After all, the Congress—. JAY: Now you’re talking a revolution. You’re going to get the Congress more backbone in relationship to Wall Street? EPSTEIN: Yes. So that’s really—. JAY: You’re talking more than transplant surgery. EPSTEIN: Absolutely. We need a revolution of our democracy. As I said before, we have to get money out of politics. And unless we do that, none of this is going to happen. JAY: If the legislation that’s working its way through Congress is not likely to be very effective (and we could very well be in the same moment a year, two years from now—who knows?—where we have another structural blackmail and meltdown), let’s talk about what ordinary citizens should be trying to do and what they want. I mean, if one assumes people should try to get involved in electing people who want to do the kind of reform of the Fed you’re talking about, what other things should they be demanding and demanding of people who are running in elections? EPSTEIN: First of all, they need to be demanding accountability from the banks themselves. I know there’s a lot of antigovernment fervor out there, particularly on the right among the libertarians, and a lot of it’s well taken. But oftentimes in this it’s the big banks are let off the hook. So, first of all, we have to demand to cut the banks down to size, get more accountability of the banks, get more regulation of the banks. JAY: I think one of the things the libertarians miss in the solution of, well, let them burn; it’s ’cause they took the risk; let them suffer for it. It’s not only the point that a lot of ordinary people suffer in the course of that, but as importantly or more importantly, it leads even more monopolization, because, you know, some of them are going to burn, but what’s going to happen? You’re going to be left with one or two behemoths standing. EPSTEIN: In fact, that’s exactly what’s happened. As more and more banks are becoming insolvent, as the crisis hit and banks were merged, now the behemoths have gotten bigger and the concentration is gone up. That’s precisely what has happened. JAY: And why is there no conversation about using antitrust legislation to break these banks up? EPSTEIN: Well, there’s some conversation, but not enough. So I think we have to bring back antitrust legislation, serious enforcement of antitrust as well. But to get back to the point about what citizens can do, they have to insist that their congresspeople stop taking money from the banks and from the big corporations, and they have to insist that staff members who work for their congresspeople stop going to work for the banks and the other big corporations after they’re done with their stints in Congress. That is, we have to end the private financing of our elected officials, and we have to end the revolving door. And I think that’s the most important thing that citizens can demand. JAY: So they could be asking their elected representatives, or people running, for pledges on this and to be transparent about their records on this. JAY: Thanks very much for joining us, Gerry. JAY: And thank you for joining us on The Real News Network. And for full transparency, on behalf of the Real News Network, we need support from you to keep doing what we’re doing. So please look at the Donate button here. You can click and donate some money. Or if you in the United States, you can text us. Just text the word "news" to 85944, and you’ll be sending us $5. Thanks for joining us.